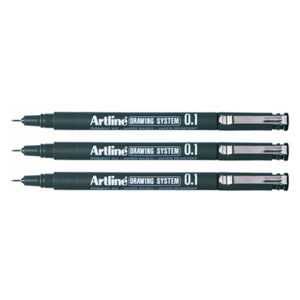 The Artline 231 Technical Pen creates fine lines for drawing, technical drawing and general writing. The acid-free, water-based ink is fade-proof, water and smudge resistant, making the Artline 231 Technical Pen perfect for precision work. Ideal for professional draft work, the Artline 231 Technical Pen glides smoothly and steadily against rulers and stencils.